Once we arrived, we admired the classy lobby for a moment and the hall that is decorated in such a tasteful way. The whole hotel is so modern and harmoniously decorated that it makes me wish I had the possibilities to stay longer. 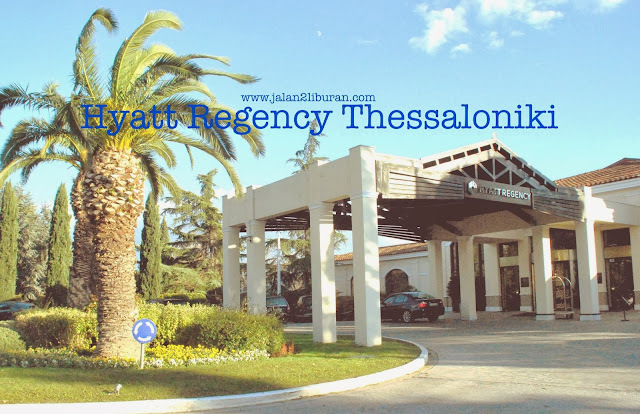 Hyatt Regency Thessaloniki is located in the neighborhood of airport which is around 20 minutes driving from the city centre, but DO NOT worry, there s several complimentary bus shuttles which going to bring the hotel guests to the city centre and return. Once i m in the hotel, actually i m not in the mood to go to the city, somehow the hotel is like a small city and resort in one package, there s a hairdresser if you have a bad hair day, there s a spa if you feel cranky after the long haul flight, there s a gym and warm indoor pool, and the outdoor pools are simply amazing. 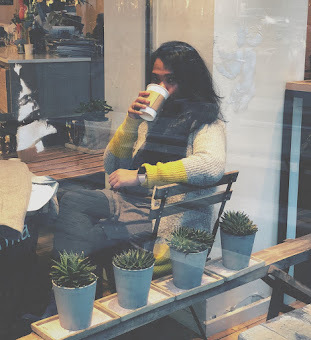 Since my husband has a passion in mediterranean plantations, he loves the variety of plants that grow in the garden and how well managed they are. 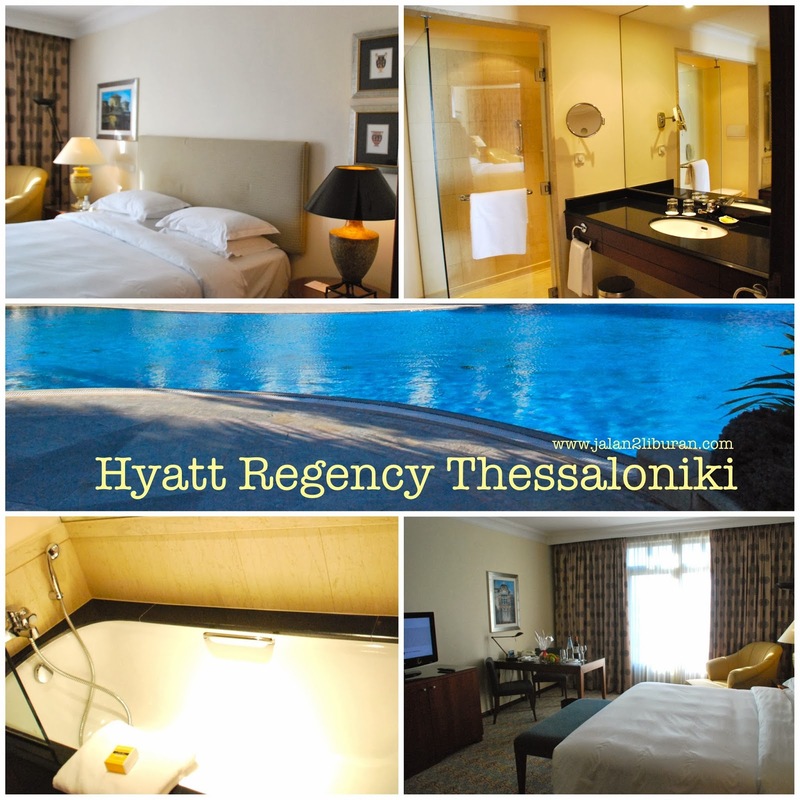 I found it difficult to describe how wonderful the staffs of Hyatt Regency Thessaloniki are , they are more than just a hotel staffs, i feel like they are my old friends that have been long time no see, yes that close and sincere. Somehow, I feel that they are working with passion and love, and as guest, I feel immediately their hospitality. 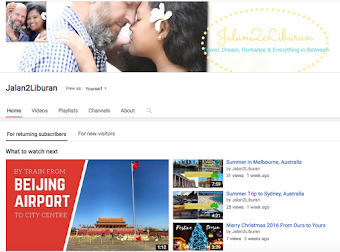 We stayed in one of the beautiful room and we were completely smitten by the decor from the moment we walked it. The room was very spacious and elegantly decorated in an everlasting classic style. The furniture was chosen to perfectly fit the style of the hotel, which gave the whole place a homey continuity. 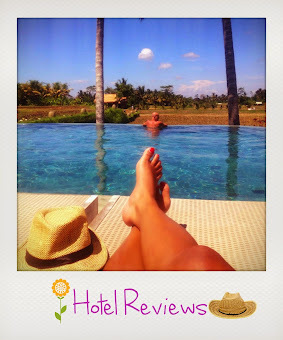 The room was fitted with a really comfortable bed (and a very soft bed cover and comfort pillows-i really glued with the bed) , LCD TV, safe and free internet access, all of which were very welcomed by both me and my husband. 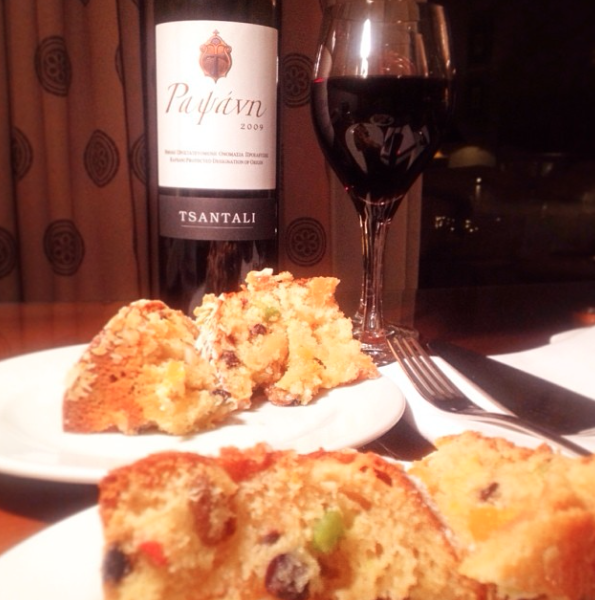 On the desk, we enthusiastically find a welcome letter, a bottle of Greek red wine and plum cake , exactly what we needed after a train journey from Kalambaka. When we wake up in the morning and pull the curtains back, gentle sun rays find their way inside our suite and the balcony view to the pools and garden. The bathroom has a spacious size with the toiletries from Pharmacopia and the fluffy bathrobes is prepared for us. 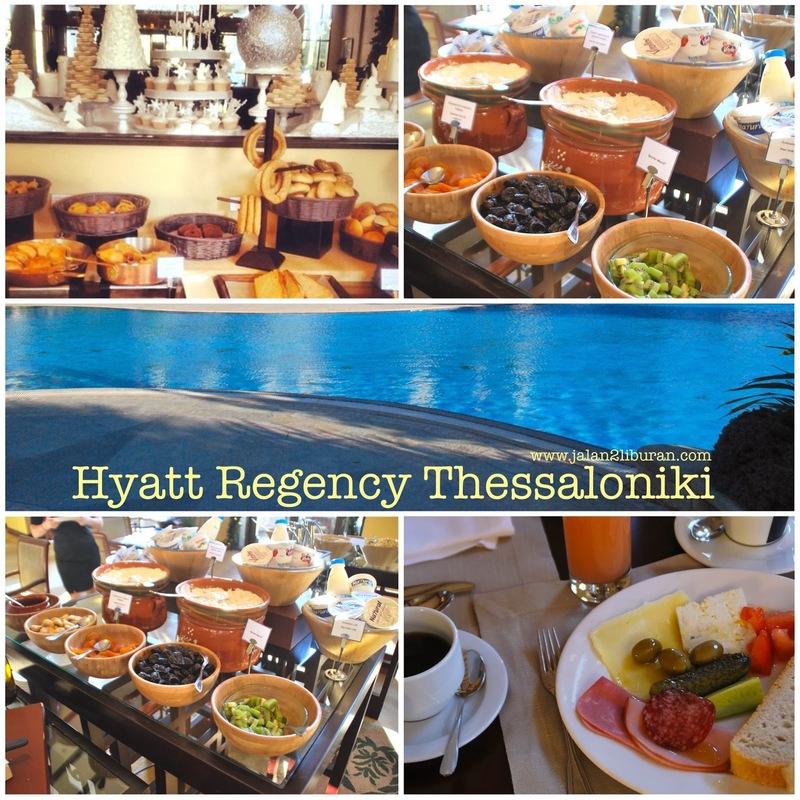 Having breakfast in Hyatt Regency Thessaloniki was a real treat. A different kind of breads, cheese, meat platters, fresh salad & fruits, Greek yoghurt, and many other more. Hyatt Regency Thessaloniki is also pay attention in every small details, such as they offered a different kind of milk even for vegetarian. 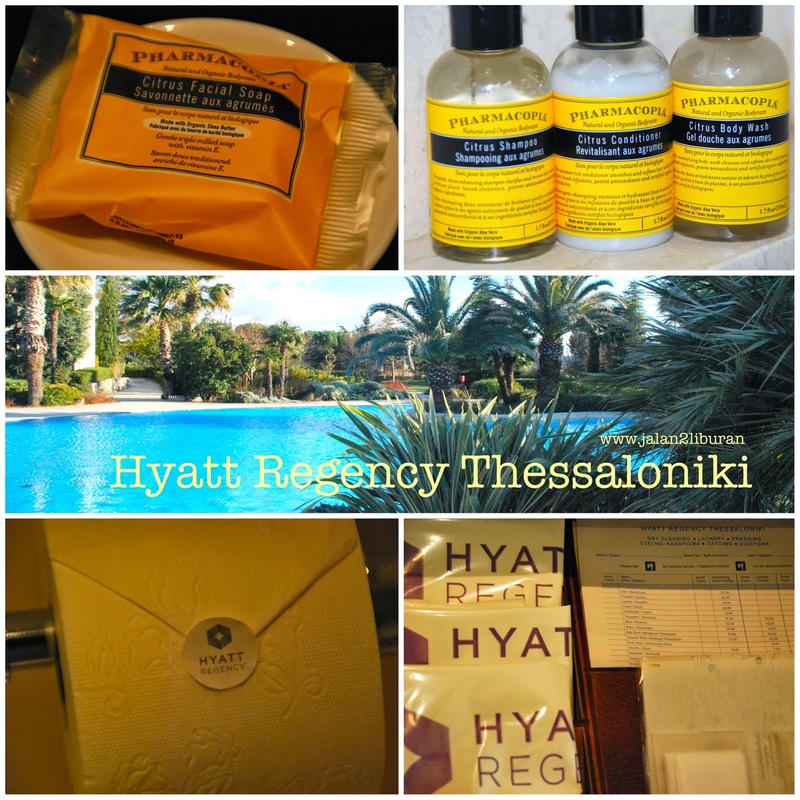 We could really tell from the way everything was displayed carefully that hygiene and cleanliness were a primary concern at Hyatt RegencyThessaloniki. On our request, we were also shown one of the available suites, which one of them is Presidential Suites. Rows of famous names were ever stayed in this suite, such as Scorpions, Eros Ramazotti, Michel Gorbachev, etc. 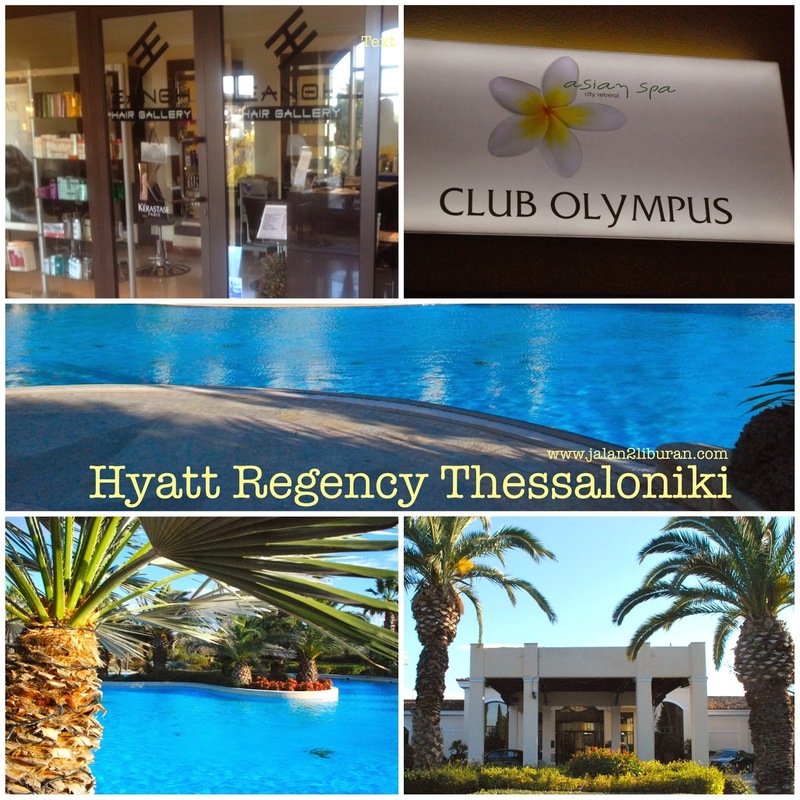 We were guests of Hyatt Regency Thessaloniki, however, all opinions expressed here are entirely our own and based on our personal experience. I would only ever recommend something that I actually enjoyed and support!